Charles Burchfield is one of the best known American watercolorists of the 20th century, painting urban street scenes as well as more rural landscapes in a rather sullen fashion. 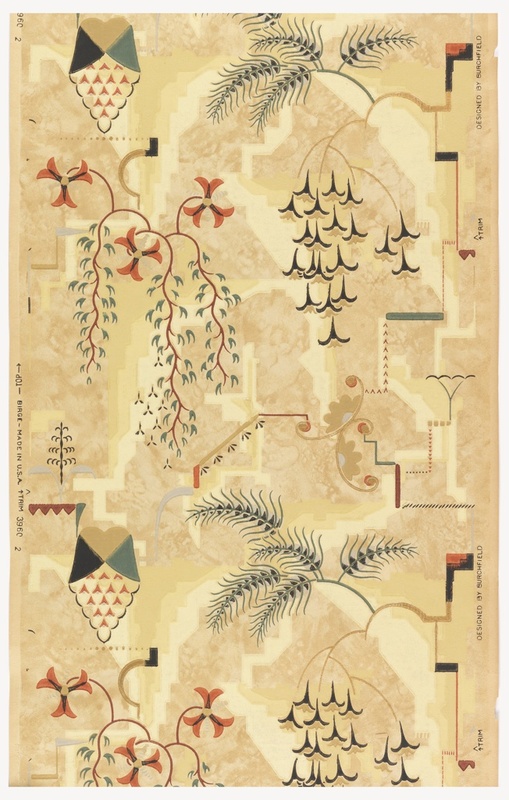 It is less well known that he designed wallpaper, working for the M. H. Birge and Sons company in Buffalo, New York, from 1921 until 1929, becoming the chief designer in 1927. He designed at least nineteen wallpapers while working for Birge. A number of his wallpaper designs were based on his paintings. Modernistic, however, is the result of the Birge company asking Burchfield to design a modern wallpaper. This design is probably the least representative of Burchfield’s style of painting, but it became one of his most popular wallpaper designs. It almost borders on Dada as the design contains a number of disparate elements that don’t seem to mean anything or have any relationship with other elements. There are recognizable signs of plant life mixed together with, or growing out of, unusual symbolic motifs. These are all printed over a mottled tan background which does pull all the parts together for a cohesive whole. All of the motifs are very stylized and minimal in design which, along with the minimal use of color, prevents the design from being overwhelming or busy. The overall design is more freeform and random in feeling than his other wallpapers. He also designed three scenic wallpapers during his tenure at Birge. The Cooper Hewitt collection contains six different designs, including a couple designs in multiple colorways. If only some stylish wallpaper company would reproduce them!